Each Friday I'm hoping to post my favourite five things from a particular topic. To start things off I thought I'd go with a relatively easy subject, video games. 1) Terraria - Terraria is a 2D action/adventure sandbox game where you are encouraged to go exploring through various layers (all the way down to the underworld), collecting materials to create new weapons and armours to beat stronger mobs and bosses. It was a close call as to whether I'd include Terraria or Minecraft, but in the end I prefer that Terraria feels bigger, even if the maps are smaller. There seems to be more to items to craft and there's a definite game progression, where as I find in Minecraft you could go straight to the end boss very quickly after starting a new game. There are two new Terraria games in the works which I'm really looking forward to, Terraria 2 and Terraria: Otherworld. 2) Lego Series - The Lego games are a series of action/adventure platform games, covering a variety of franchises. The aim is to collect Lego studs to allow you to buy new characters, with new abilities to unlock new areas in levels and reveal new bonuses. There have been a number of franchises that I've played, including Marvel, DC Superheroes, Indiana Jones, Star Wars, Harry Potter, Lord of the Rings, Pirates Of the Caribbean and Jurassic World. I really enjoy all the games so I've included them under a single banner so I don't have to pick an individual game to include. When I bought my Nintendo Wii it came with the first instalment of the Indiana Jones games. After playing this I got into other franchises as they came out, it was such a relief when independent screens for co-op was introduced it stopped me and my partner bickering as to which way we should go in the level. One downside however is that I found it strange playing the games before seeing the film (I'm looking at you Pirates of the Caribbean!). The games are very family friendly and I'm looking forward to playing them with my son when the time comes. 3) Mario Kart Wii - Mario Kart is a fun racing game featuring everyone's favourite plumber. The games feature a variety of characters from the Mario games, each with their own attributes that affect the acceleration and top speed. Racers pick up random items that can be used to either attack the other competitors or defend against incoming attacks. I remember playing on the original Mario Kart on my SNES, definitely one of my favourite games and I'd lose hours playing it. When I picked up the Wii version and it took me right back. It's amazing how competitive people get playing Mario Kart and all friendships are put on hold for the races - people happy to end up at the back of the grid just to get a blue shell just to stop someone winning the race! 4) Gears of War 2 - Gears Of War is a third person shooter based in the fictional planet Sera in the middle of a war against the Locust. Back in 2008 my partner and I visited Australia, but she kept mentioning that a new game was being released whilst we were away and that she wanted someone to pick up a copy for her so we could play it upon our return. This game was Gears of War 2. Although I struggled initially with the game, I soon felt more confident and then began to enjoy it. I love that we could play it in co-op on such a good game, and playing on different difficulty levels at the same time meant that we were able to play to the level we wanted to. The biggest issue I have is on the multiplayer games. I really hate the Gnasher dash people do, whereby people are able to run up using the shotgun and can generally 'one-shot' their opponent. 5) Batman Arkham City - Batman Arkham City is the sequel to the Arkham Asylum game. In it you place Batman rounding up Gotham's most wanted following a break out from prison. The game incorporates stealth, detection, combat and, of course, bat-gizmos. I'm a huge batman fan, so I was looking forward to playing the batman and it doesn't disappoint. The combat is fluid and the open nature of the game really appeals to me, you can chose what to next whether it's going after some gangs causing trouble, doing side missions or continuing the story. As with most games I struggle with flying, I just don't seem to be able to master descending using the cape, but that's more about me rather than the dynamics of the game. My only other grumble is that it's only a single player, it would be great if my partner could join in when I play. Minecraft - Such a massive game, whether it be the worlds that are generated or the cultural impact it's had. I love that someone has created Denmark in Minecraft and some of the creations I've seen online are truly inspiring. FIFA - I've played Fifa games from right at the beginning (FIFA International on the SNES) and I've stuck by them which ever console I've been playing on. The biggest issue I've got with them is that they don't seem to have step change improvements in recent years, so I struggle to justify buying a new copy every year now. Call of Duty - I never played the early games, but I ended up playing Modern Warfare and Black Ops due to others telling me I should play them. I enjoy playing the online modes, the story modes have been quite short and felt more like they are a justification for the multiplayer maps. So there they are my favourite five video games. Have I missed any you think should be included or are there some games you recommend that I try out? Leave them in a comment below. 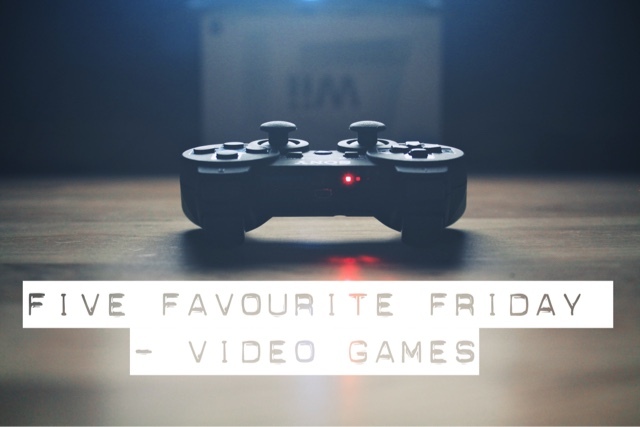 Also be sure to check out my partner's Five Favourite Friday blog post, she's going to set the topic for next week.